Dad Disowns Daughter After Rejecting Gay Son: The pro-gay father took a drastic step when his daughter, “Christine,” kicked her son out of her house after telling her he was gay. “Dear Christine: I’m disappointed in you as a daughter,” Chad’s unnamed grandfather writes. “You’re correct that we have a ‘shame in the family,’ but mistaken about what it is. Kicking Chad out of your home simply because he told you he was gay is the real ‘abomination’ here. A parent disowning her child is what goes ‘against nature. The only intelligent thing I heard you saying in all this was that “you didn’t raise your son to be gay”. Of course you didn’t. He was born this way and didn’t chase it any more than he being left-handed. You however, have made a choice of being hurtful, narrow-minded and backward. So, while we are in the business of disowning our children, I think I’ll take this moment to say goodbye to you. I now have a fabulous (as the gays put it) grandson to raise, and I don’t have time for heart-less B-word of a daughter. The letter was posted on Monday to the pro-gay youth organization FCKH8’s Facebook page. It received more than 5,000 shares, 11,000 likes, and 600 comments. 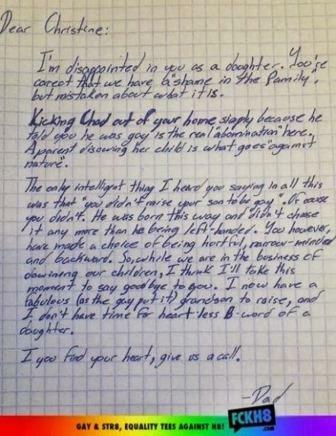 FCKH8 spokesperson Luke Montgomery spoke to the grandfather and grandson to confirm that the letter is real. “We get letters and emails from fans of our equality T-shirts all over the world who want us to share it on Facebook and spread the word for the cause,” Montgomery tells Yahoo Shine. Because the letter has received such spotlight attention since its release, FCKH8 spokesperson Luke Montgomery confirmed with the grandfather and grandson that the letter and details in it are factual.